American 50K record holder Josh Cox and Chi Running creator Danny Dreyer will be featured at the 2011 Sports & Fitness Expo, Sept. 15-16, according to Air Force Marathon officials. 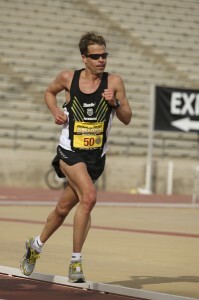 Cox, who also holds the Air Force Marathon course record, ran the Air Force Marathon in 2:20:57 in 2007. The 35-year-old from Mammoth Lakes, Calif., is also a four-time U.S. Olympic Trials qualifier and a three-time U.S. National Team member. Dreyer apparently will be putting in his second appearance at the expo. The running guru, who has blended the movement principles of Tai Chi with running, was a presenter at last year’s expo. In addition to Cox and Dreyer, ultra-marathoner Marshall Ulrich will be in the building. Ulrich has run more than 100 races over 125 miles each. He also scaled the Seven Summits, including Mt. Everest, all on his first attempt. He is the author of “Running on Empty,” which chronicles his 3,000-mile run across America. Dr. Mark Cucuzzella, the Air Force Marathon medical consultant, representatives from the Pace Team and Jessica Hardisky, a Dayton area yoga instructor who will offer some hands-on stretching techniques also will participate in the expo. They expo will be held at the Wright State University Nutter Center. Race day for the 15th Air Force Marathon is Sept. 17. For more information, visit www.usafmarathon.com.